At the same time that Yongnuo announced their new LED-equipped TTL flash, the YN986EX-RT, the company has also revealed plans for an updated version of their Canon 600EX-RT rival, the YN600EX-RT. 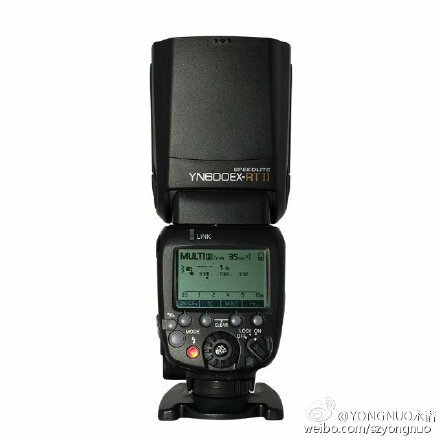 The second-generation flash will be called the Yongnuo YN600EX-RT II. No technical details have been released yet — a teaser message on Sina Weibo, the Chinese microblogging site, says “stay tuned”. There is not a lot to separate the YN968EX-RT from the YN600EX-RT in terms of features, other than the LED video lamp. So it will be interested to see how the YN600EX-RT II distinguishes itself. This year, Canon updated their Speedlite 600EX-RT to the 600EX II-RT, which has slightly faster recycling times. The Canon flash is available now for $529 from Adorama, B&H Photo and other retailers. The Yongnuo YN600EX-RT is available from Adorama, B&H Photo and eBay for $114.